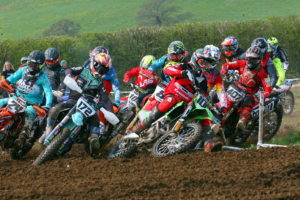 The Hampshire Motocross club rocked up to Swanmore for the second round of their 2019 Club Championships, where the circuit and the riders served up an almighty dollop of great racing. Luke Lambert reigned supreme in the Small Wheel 85’s with a hat-trick of great wins for the overall ahead of second-placed Jack Parker, with Rowan Brock edging out Finley York-Williams for third. In the Big Wheel 85’s Charlie Parrott got his head down after finishing third in race one, to take the two remaining Moto wins and the overall. Callum Jones would take the chequers in race one, and finished second overall with Harrison Jepson third. The Rookies were low on numbers but that made little difference to Liam Brosnan who powered to all three race wins and the overall ahead of second-placed Jake Tunnell, with Sam Upton third. Steve Wells showed his rivals a clean set of heels on each occasion for the Over 50’s win from Tom Lowe and Steve McCormick, while Tony Tunnel was the dominant force in the Over 40’s going unbeaten for the win ahead of Rupert Heaton in second and Shaun Brooker third. Sam Purkiss was a class act in the B Class racking up three moto wins for the top spot on the podium come the end of the day. Jake Butler put in three good rides for second with Michael Webb rounding out the top three. It was another three ride win maximum in the Adult A group with Nicky Watt doing the business with the overall. Riley Lowe followed Watt home on each occasion for second with Craig Daffin third. The club now head to West Meon this Sunday for round three of their championship.